For cultural information on Runner Beans, please see the Scarlet Runner variety page. Southern Peas (Cowpeas) are listed separately. How to Grow: Beans grow well in any well-drained garden soil, but do best in soils with pH above 6.0. After the last frost, plant seeds 1 in. deep and 2 in. apart in rows 12 to 18 in. apart, thinning to 4 in. apart. Beans may benefit from a source of soluble nitrogen (if your soil is low in nitrogen) during the first 3 weeks until nitrogen-fixing nodules develop, but do not apply nitrogen after this period. Dark-seeded beans are more resistant to rotting in cool soil than light-seeded beans. 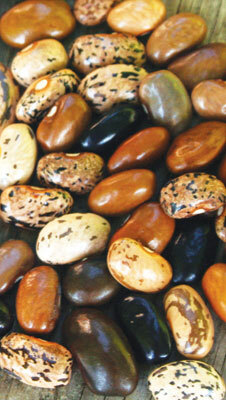 Beans need a minimum soil temperature of 65 degrees F to germinate well, otherwise seeds may rot. Succession: Plant every 3 weeks for a steady supply. 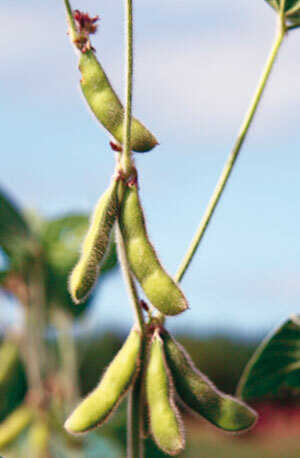 Hot weather: in deep summer heat, snap bean flowers may not set pods; southern peas and asparagus beans are more reliable producers at these times. Harvest: Pick when pods are small, before seeds fill the pods. Keep well picked so that plants continue to bear. Storage: Keep dry - wet beans will mold in storage. Diseases: Rotate on a 3-year cycle if disease is a problem. Don't cultivate or harvest when foliage is wet since anthracnose, bacterial blight, and rust diseases may be spread. Avoid watering the plants in the evening. Mulch plants to prevent rain from splashing dirt on beans. Insect Pests: Use rotenone, or introduce the Pedio Wasp (Pediobus foveolatus) to give excellent biological control of Mexican bean beetles. Seed Savers: Isolate bean varieties a minimum of 25' for home use. For pure seed an isolation distance of 100-150' is required. Packet: 1 oz (28 g) unless otherwise indicated (about 50-105 seeds depending on variety) sows 10-18'. 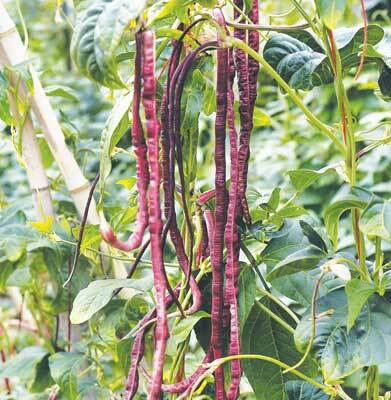 Culture: Pole beans usually bear later than bush beans and generally give higher yields, usually bearing for six or more weeks. Poles or other means of support should be at least 8 ft. high. Sow seeds 1 in. deep. Along a trellis, sow seeds 4 in. apart, thinning to 8-12 in. apart. With a bean teepee, sow 6 to 8 seeds around the base of each pole. Corn plants may be used as bean poles. We recommend using tall, sturdy dent corns like Tennessee Red Cob, Pungo Creek Butcher, and Hickory King. Note: Only certain varieties of beans are shade tolerant and adapted to growing in corn, though most grow well along the outside rows. Greasy beans: Greasy beans are a southern Appalachian specialty, mostly found in SE Kentucky and western North Carolina. The pods have a shiny/hairless look to them, hence "greasy"; the hairless pods keep fresh longer. Old-timers love them for their great texture and flavor, and will tell you that any bean that doesn't have to be stringed isn't worth eating! Packet: 1 oz (28 g) unless stated (approximately 75-115 seeds depending on variety, average 75 seeds) sows 12-18 poles. How to Grow: Asparagus or "yard-long" beans originated in Southern Asia and are now grown extensively in Asia, Europe and more recently the U.S. Although they resemble pole snap beans, they are more closely related to southern peas (cowpeas). Asparagus beans are called "Dow Gauk" in China and "Sasage" in Japan. Asparagus beans are easily grown, produce heavily, harvest easily, thrive in hot weather, when snap beans may not produce, are slightly more resistant to drought than snap beans, are much more resistant to bean beetles, and are tolerant of a wide range of soils. Need warm soil to germinate - sow a month after last frost. Grow in the same manner as pole beans or along a trellis, sow seeds 3/4 in. deep, 4 in. apart, thinning to 8 in. One planting along a tall trellis will produce well all season. Harvest: Harvest when pods reach 12 to 15 in., before the seeds fill the pods. The mature beans may be threshed or shelled from the pods and cooked in the same fashion as regular dried beans. Their flavor is like southern peas but with a drier, nutty quality. Young leaves and stems are also edible. Flavor: Sweet and mild, resembling the combined flavor of asparagus, mushrooms, and beans. Serving suggestion: Braid or tie into knots before cooking. Seed Savers: Isolate from cowpeas and other varieties of asparagus beans by 150'. Packet: (4-7g) (24 to 55 seeds, depending on variety) sows 20'. Culture: Edamame is very easy to grow - as easy as growing any bush bean. It's planted the same way as bush beans, and a mature soybean plant (edamame plant) is 2-5 ft. tall. After the soil has warmed to 65 degrees F, sow seeds 1 in. deep and 2+ in. apart, in rows 15-30 in. apart. Don't rush planting; if the soil isn't warm enough, seeds will not germinate. Do succession plantings for an extended harvest. Harvest: Manually pick the immature green pods when 88-90% filled out. If pods are allowed to turn yellow much of the quality is lost. Beans reach their maximum sweetness about a month after flowering. 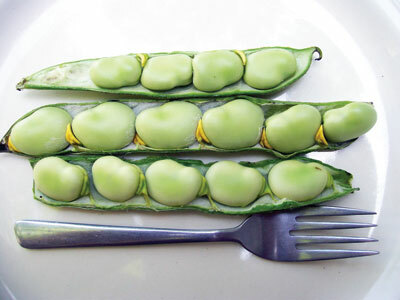 Quality is best when the pod is plump and bright green, similar to snow peas in color. Cooking: Most often served steamed in the shell - but don't eat the shell. Seed Savers: Isolate varieties a minimum of 25' for home use. How to Grow: Favas have approximately the same cultural requirements as peas. Sow seeds 4-6 in. apart in rows 18-36 in. apart. Use as a frost-tolerant, spring-planted lima bean substitute from Virginia northward. Fava beans thrive in cool, rainy areas and are planted as early as March/April so that plants are flowering when daytime temperatures average less than 70 degrees F. From Virginia northward, favas are planted in the spring, whereas in Gulf Coast states and warm coastal areas they may be planted from October to December for harvest in March. Favas have a flavor that is similar to a blend of limas and peas, but are more nutritious than limas. For use as a snap bean, harvest the pods at 2-3 in. For use as a green shelled bean, harvest when pods are 4-7 in. long. Prepare in the same manner as peas or beans. Caution: A small percentage of people of Mediterranean descent may experience a hereditary reaction to fava beans. Packet: 1-2 oz (28-57 g) sows 12-18'. How to Grow: Limas need a warmer soil than snap beans, wait to direct sow until at least 2 weeks after last frost. Plant seeds 2-3 in. apart, thinning to 4-6 in. Be sure the soil is well drained. Harvest: Limas can be used fresh when beans fill the pod, or they can be left to dry in the pod to be used as dried beans. Packet: Seed size varies considerably: 2 oz (57 g) unless stated (40-85 seeds depending on variety), sows 6-20 ft. Seed Savers: Isolate lima bean varieties by at least 160-500 ft.
How to Grow: See snap bean cultural notes above. Harvest: Harvest dried pods before rains so seeds won't mold inside pods. Continue drying pods for 2-4 weeks under cover before shelling and storing. Packet: 2 oz (57g) unless otherwise noted. Seed size varies considerably; see variety descriptions for seed counts. Seed Savers: Isolate from snap beans and other drying bean varieties by 125'.